Since Scott pitched in high school and college, baseball season is of utmost importance to him. Today is the beginning of the season (the very loooooong season! ), and we always welcome it by having some ballpark fare. As you know, ballpark food definitely does not fall under the category of healthy and nutritious eats. But, there are alternatives to the standard favorites. I love a good burger, and while I love red meat, I actually prefer turkey burgers. 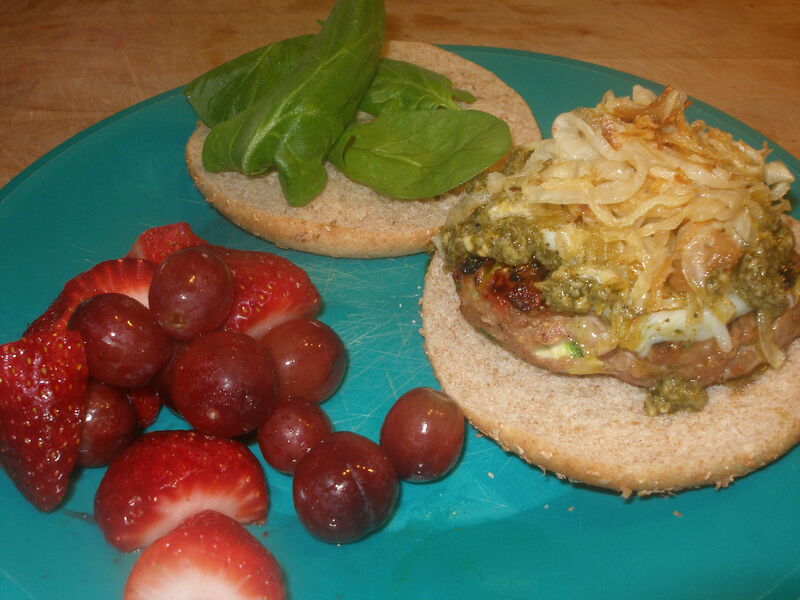 I love to top my grilled turkey burger with pesto, caramelized onions, and a bit of mozzarella cheese. Here is my recipe. Don’t skip the zucchini- it keeps the lean meat moist. You can always replace the zucchini with yellow squash or carrots. 1. Mix turkey, egg, zucchini, oats, Italian seasoning, and a dash of salt and pepper in a bowl. Form into burger patties. 2. Grill over medium heat for about 5-6 minutes for the first side. Flip burgers and grill another 5-6 minutes. 4. Place buns on indirect heat at the same time you top the burgers. Serve with your favorite toppings.